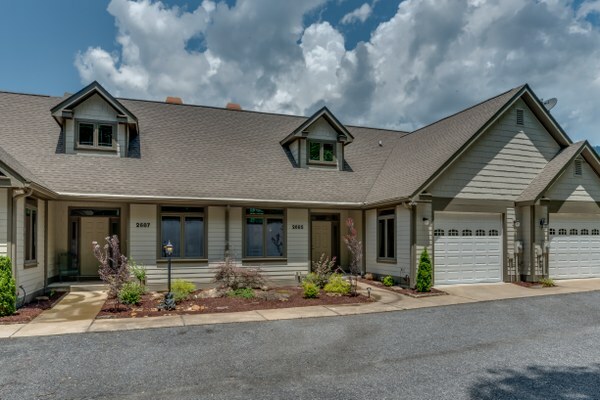 The Lakeside Town home on the shores of famous Lake Lure features resort syles surrounding within walking distance of the home. The unit offer well built construction and low maintenance feature making this property, easy living. 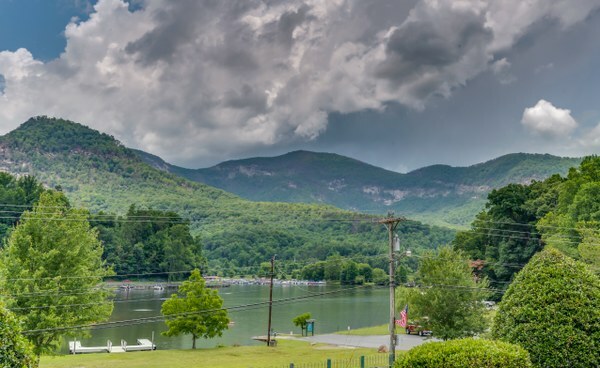 VIEWS, VIEWS of Lake Lure, Chimney Rock, and the surrounding majestic mountains. The Lake Lure downtown and beaches are just steps away. The Living Room utilizes high ceilings and affords plenty of natural light, hardwood floors, gas log fireplace and French door with direct access to a partial covered deck with views to die for. 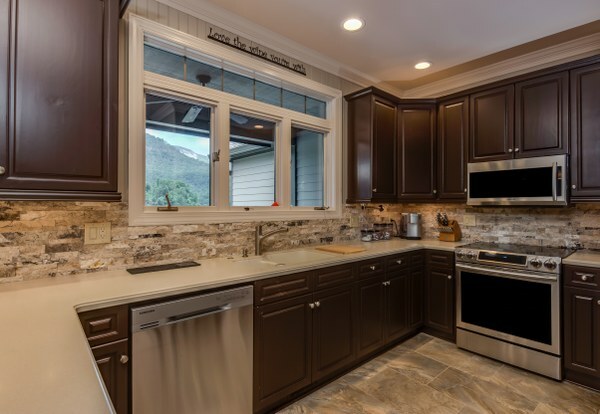 The Kitchen is a chef's delight and has been completely updated. 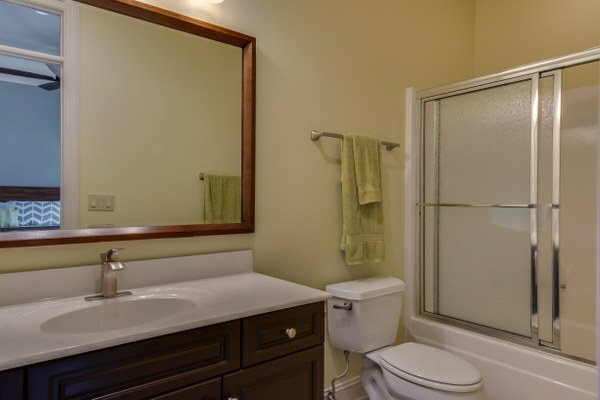 The Kitchen features high end stainless appliances, double deep bowl sink, tile floors and cut stone backsplash. Who would't want to do dishes, check out the view. Informal Dining Room allows the home to flow with the open floor plan. 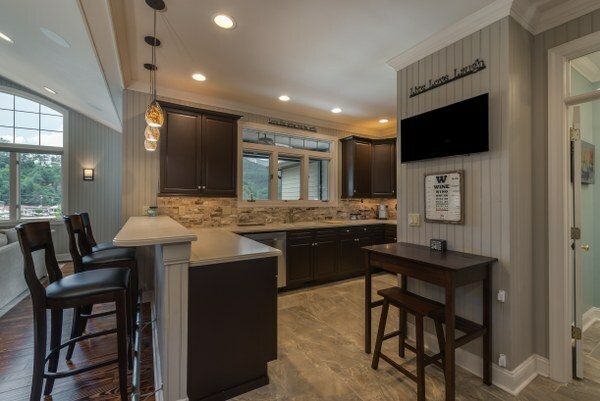 Notice the many details of the home from the hardwood floors, beadboard wall covering, wall sconces, and lighting pendants above the breakfast bar. 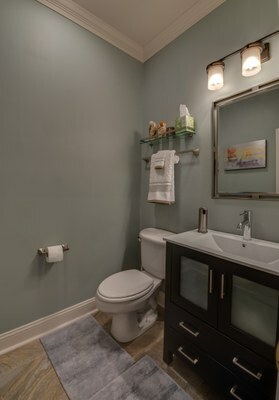 The half bath on the main level is spacious. Details abound in this updated space. Guest bedroom suite on the lower level offer high ceilings, access to the covered patio, new carpeting and a spacious private bathroom. Guest bedroom Full bath with tub. Master Bedroom Suite, a very cozy space with plenty of natural light or utilize the blackout curtains for sleeping in after a fun night out on the town of Lake Lure. Notice the access to the covered patio. 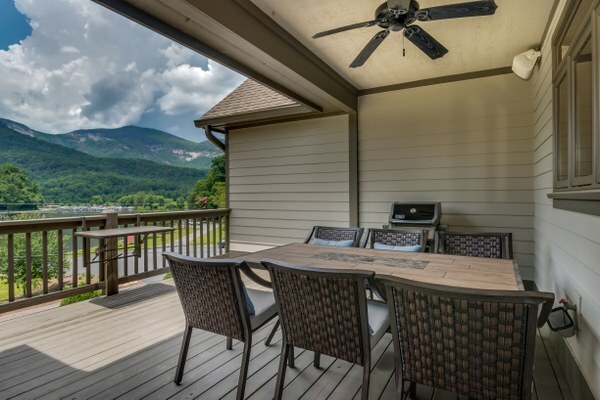 Main Level deck is large enough to seat 6 at a full size table and still have room for grilling and enjoying the view. Out door speakers and ceiling fan make this space somewhere that will be utilized a good bit of the time. Check out the view! 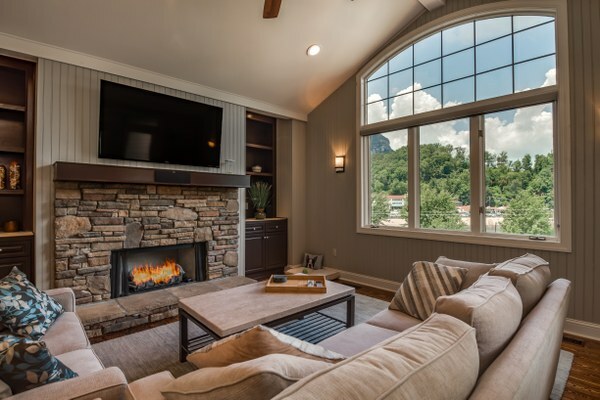 The Rear Elevation of the townhome shows the appeal of this lock and go living style, in the resort town of Lake Lure.